Quick overview Offers an introduction to the field of Chinese religion and culture. This work seeks to guide readers through some of the primary source material and to introduce them to continuing, contemporary debates and interpretations of religious ideas, concepts and practices in China and beyond. "Chinese Religion" is a new introduction to the field of Chinese religion and culture. It seeks to guide readers through some of the primary source material and to introduce them to continuing, contemporary debates and interpretations of religious ideas, concepts and practices in China and beyond. Religious beliefs are never pursued and held in a vacuum; they are an integral part of a particular culture, interwoven and interactive with other elements of the culture and tradition. Chinese religion in this sense can be said to be part of Chinese culture and history. 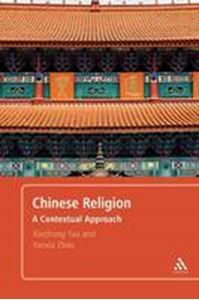 In this clear account, Xinzhong Yao and Yanxia Zhao move away from the traditional and outmoded definition of Chinese religion, the three institutional doctrines: Confucianism, Daoism and Buddhism, towards a multi-layered hermeneutic of the syncretic nature and functions of religions in China. Additional features include questions for reflection and discussion and suggestions for further reading at the end of each chapter.